There’s growing evidence that iTunes might be split up in macOS 10.15. For movies and TV shows, this makes a lot of sense. When it comes to music, this scares me. I’m not going to try and convince anyone that present day iTunes is a great app. It’s bloated and confusing. It does too many things, and does many of them poorly. As someone with with movies and TV shows in Apple’s ecosystem, I’d love purpose-built apps for viewing that content. With the upcoming Apple TV+ service, there’s an even greater need for Apple to get this right. But music is something different. Apple already has a separate music app on iOS. In my opinion, that app is lacking. Based on what we can see of the current “marzipan” apps, it’s likely that the macOS version of Apple Music won’t be much different than the iOS version. You might wonder why I care so much about this. Let me give you some background. The first thing I bought through iTunes was Zero 7’s “Somersault” single on December 3, 2004. Between then and now, I purchased 2,051 songs, and 27 music videos through the service. In total, my library now contains 11,885 items. This includes 6,340 songs uploaded into iTunes Match and Apple Music over the years. I say this not to brag about the size of my library, but because it’s large enough that I sometimes have trouble finding things in it. With the features in iTunes I was able to find the above statistics about my music. Maybe this isn’t something you care about, but I really do. I love music, and many of my most important memories are associated closely around times when I first heard a song. It’s really great to be able to look up roughly when that was. Also, Apple Music as a service isn’t perfect, and there are sometimes songs that get mangled or are “no longer available”, and I need help retrieving them. I’m a heavy user of smart playlists. You can view these in the iOS Music app, but you can’t create them there. Smart playlists are part of how I was able to easily look up the above song counts. It’s also how I can salvage music from when Apple Music loses the plot. More than that, they keep track of music as my tastes change, and allow me to automatically create lists of my favourite songs through the years. I live inside of the “Songs” view, which looks like a giant spreadsheet. I love it, and it’s the only way music makes sense to me. It allows me to sort and find songs using dozens of configurable categories. This sort of sorting and filter is something I do pretty much every day as I waffle between music selections. My biggest worry is that a new “Marzipan” music app won’t have any of these features. At least at first. I just hope that Apple has a place in their hearts for music weirdos like me. They’re always talking about how passionate they are about music, so I hope there are some one staff that understand. 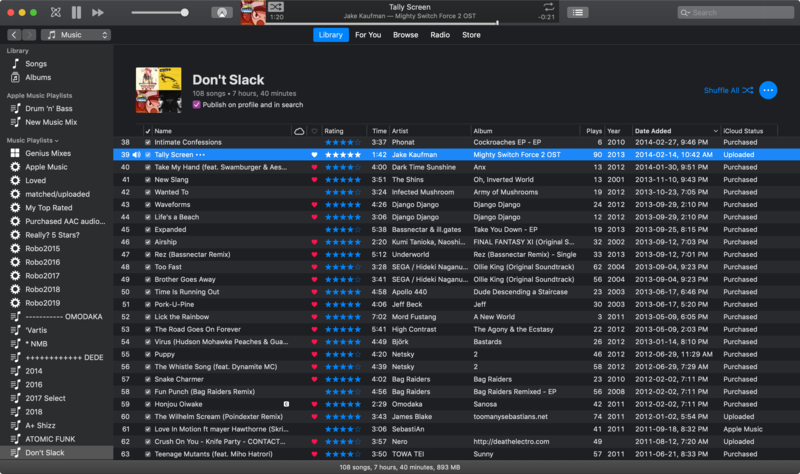 iTunes isn’t the best software around, but in terms of music, it does everything I want it to and it does it well. Who knows, maybe the new app will eventually gain a lot more functionality than the current iOS music app. I’m just not holding my breath.